The haze is expected to worsen again over the weekend in Bangkok after the cold front over Thailand dissipates, according to the Meteorological Department. The baht’s value could appreciate to 31.50 against the US dollar this quarter because prevailing global financial volatility is poised to compel investors to seek refuge in new safe-haven destinations, says Kasikornbank (KBank). 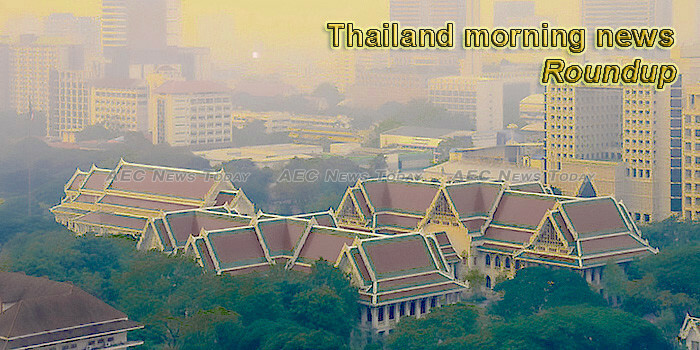 Police have been stringently screening motor vehicles for exhaust quality, amid worsening smog in the Bangkok Metropolitan Region. Meanwhile, the Ministry of Commerce has opened a sales point for face masks, to help overcome a chronic shortage. Thailand’s Ministry of Natural Resources and Environment has laid out a long-term plan to cope with particulate matter less than 2.5 microns in diameter (PM2.5). Responding to a study that says incentive travel is the fastest growing segment in Asia-Pacific’s events business, the Thailand Conventions & Exhibitions Bureau will adapt its game plan to tap this lucrative market. The Eastern Economic Corridor (EEC) project is unlikely to be affected by the upcoming election, thanks to the EEC Act that came into force last May. The National Legislative Assembly (NLA) agreed in principle on Thursday to amend the 1979 Land Transport Act to replace the old traffic violation ticketing system with a digital one. Despite increased competition from rental units in condominiums, the prospects for the single-ownership apartment market in the prime areas of Bangkok are still positive, according to property consultant CBRE. Chinese national Cherry He Ting rattles off in fluent Thai as she presents her masters thesis ahead of graduating from a Bangkok university, where she has studied for the past three-and-a-half years. A 29-year-old woman has regained consciousness following brain surgery after she collapsed while taking a Muay Thai class. In a small bookshop in Suan Phlu, a lively district of Bangkok, an unusual conversation is taking place. Two young Omura whales have been separately found on Songkhla’s beaches. They were probably from the same herd. The rejection of British Prime Minister Theresa May’s Brexit plan makes Thai bonds more attractive, says an analyst. Kenyan media have taken offence at Deputy Prime Minister Prawit Wongsuwon’s remarks on the DusitD2 hotel attack in Nairobi, in which he joked about the terrorists’ motive and suggested all that mattered was all Thais were safe. PTT Plc has cooperated with Bangkok Industrial Gas Co (GAS) to spend 1.5 billion baht to develop an air separation unit for industrial gas in Rayong province. Forty six ancient artefacts from various periods were returned to Thailand Thursday from the US. India has emerged as an inbound tourism market for Thailand, with arrival numbers expected to reach 5 million by 2023. The Thai government-initiated career development program under the social welfare card scheme has been extended for another six months. The country’s three major mobile operators are wavering on the 700-megahertz spectrum auction scheduled for May, citing the existing financial burden from previous auctions and planned infrastructure costs for future 5G development. Is the pro-election camp barking up the wrong tree? Quite likely, according to some analysts who scrutinize the 2017 Constitution beyond the contentious “150 days” rule. Thailand has been chosen as the first manufacturing hub outside Japan for Nissan’s electric vehicles, says the regional executive for Nissan in Asia and Oceania. A new tsunami-warning buoy costing B25 million that was deployed from Phuket yesterday (Jan 16) should be operational by tomorrow morning, feeding raw data to the National Disaster Warning Centre (NDWC) in Bangkok so that tsunami alerts or warnings can be issued if needed. In a fresh attempt, the Finance Ministry will call on financial institutions to encourage wealthy elderly people to forgo old-age living allowance so it can be redirected to the needy. The Ministry of Defence has weighed in on drug trafficking but in the most familiar manner. After concluding the Cabinet retreat in Chiang Mai province, the Prime Minister chaired the launch of a 1 Tambon 1 Quality School project in Lampang province. Thailand’s state energy firm PTT is planning to start a liquefied natural gas (LNG) desk in Singapore to expand its trading activities of the super-chilled fuel, two sources familiar with the matter said on Thursday. There are more than 300 temples in Chiang Mai; they outnumber 7/11 stores, which takes some doing in Thailand. An Australian woman who overstayed her visa by more than 100 days will be released from detention and deported by Thai authorities on Thursday evening.